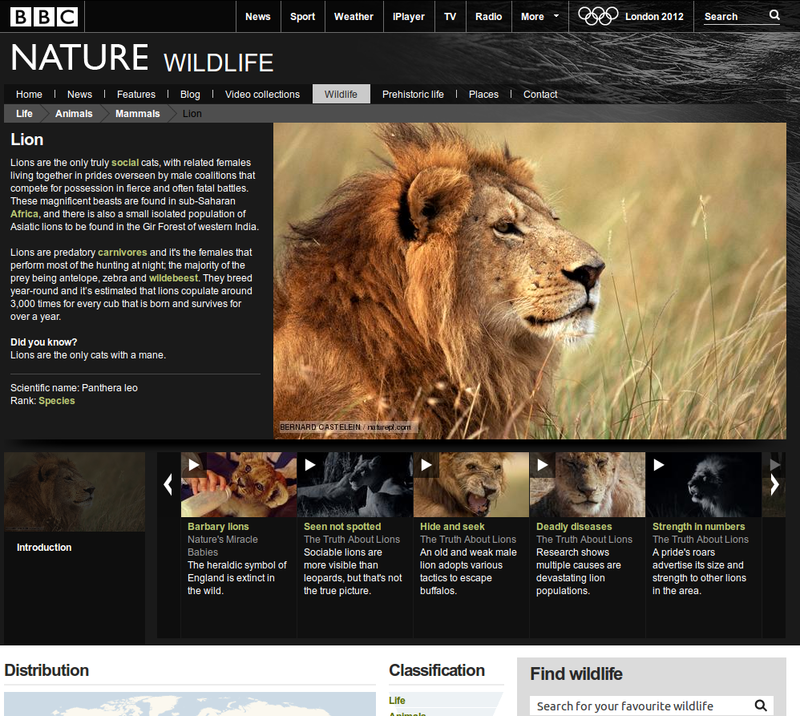 How are Semantic Web technologies currently used on the BBC website? What are future uses of Semantic Web technologies at the BBC? ... and TV since 1930. Since then it has grown to become one of the largest broadcaster in the world. The BBC had a web presence from quite early on as well. 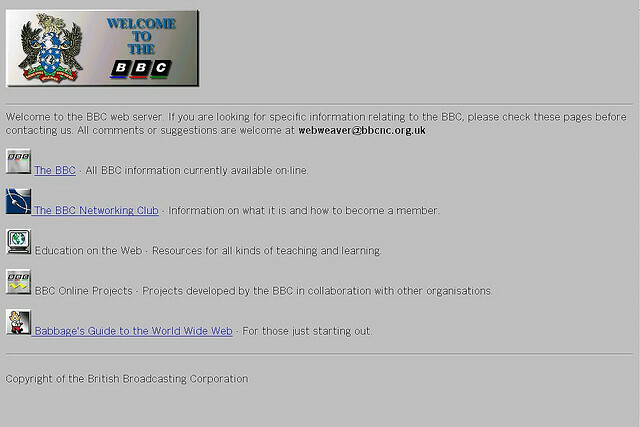 This is a screenshot of the BBC web site in 1994. Since quite early on, programme broadcast on the BBC would have a section on the BBC web site. However these different 'micro-sites' would be commissioned individually, for each programme, causing a big disparity in terms of coverage, consistency and persistency. A few programmes would get a big web presence, when a very long tail of programmes would get no web presence at all. As we broadcast between 1000 to 1500 programmes per day across around 70 channels, this approach does not scale well, if we want all these programmes to have an online presence. We launched our BBC Programmes web site in 2007 to tackle this issue, by aggregating data from multiple sources, such as commissioning data, archive data, data from playout systems, and creating a persistent web presence for each of our programme. Each individual programme has its own (persistent) URI within the BBC Programmes site. All programmes will get some web presence, which can be enriched by creating themes around the programme and adding more data around our core data. Our core data effectively acts as a backbone for all that ancillary content. 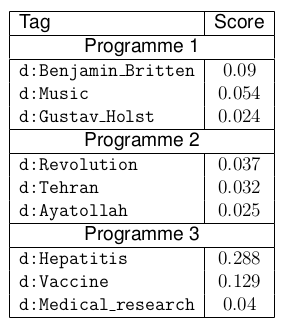 Another important aspect of BBC Programmes is that the data behind each page can be accessed through content negotiation. So if I request an RDF representation of that same programme I was looking at earlier I'll get the following. There is no separate API - the web site is its own API, and provides the data in JSON, XML, RDF and RDFa. I think BBC Programmes was one of the first large 'corporate' Linked Data site to published. Exposing all this data has many advantages. People experiment with our data and give us ideas of new sources of data to integrate or new types of user experiences. We are also working with schema.org in making it compatible with TV and radio-specific concepts. Schema.org is an effort led by major search engines, in defining bits of semantic markup that can be added to pages, and can be used by these search engines to enrich their search results. Working with schema.org means that major search engines can extract the RDFa we embed in our pages and surface more information about our programmes. For example here we see what the Google's "Knowledge Graph" has to say about the Eastenders BBC series, which includes information from Freebase and information aggregated from schema.org markup from all over the web. We also link to external sources of Linked Data like Musicbrainz or DBpedia. This enables us to use extra information held within the Linked Data cloud to enrich our pages. For example this page on Tom Waits has a biography coming from Wikipedia and artist metadata coming from Musicbrainz. The only bit of BBC data on this page is the playcount data (how much this artist was broadcast on our programmes) and the album review data. We also use the Linked Data we publish internally. 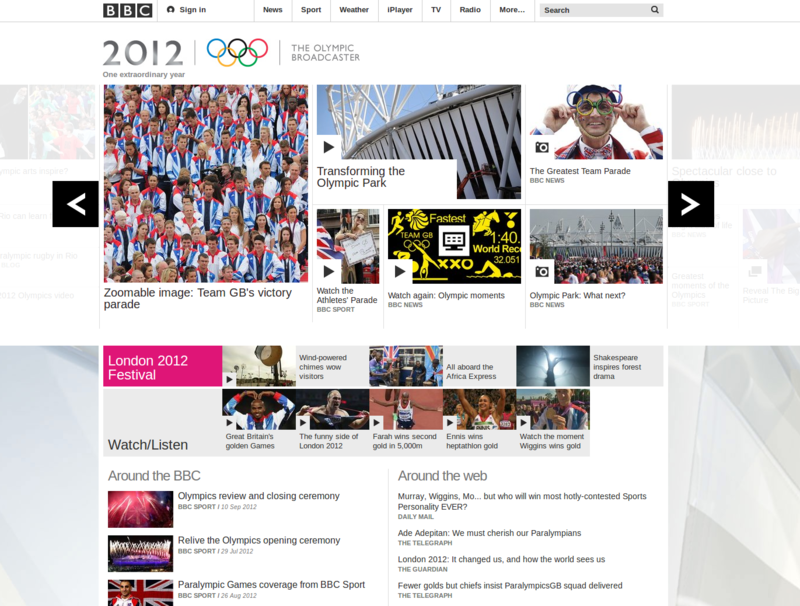 For example on this page the aggregation of programmes at the bottom is generated from Linked Data published on the BBC Programmes web site. However in this particular example the integration was ad-hoc, directly using the RDF data published by BBC programmes in this web application. This approach was first tested for the World Cup 2010 website as a mean to automate aggregation pages for example around specific teams or footballers, that were previously manually put together and maintained. These automated aggregations for various World Cup 2010-related concepts are driven by journalists tagging articles with web identifiers available in a centralised triple store and denoting people, places, events etc. and sourced from multiple data providers (including Linked Open Data sources). The resulting relationships between news articles and these concepts are then pushed to the central triple store. A benefit of using web identifiers as tags is that they are unambigous, and that we can retrieve more information about these tags when needed. For example when news articles are tagged with places URIs, we can easily retrieve the geolocation of these places, enabling us to plot our articles on a map. Tagging articles with URIs enable us to tackle a wide range of unforeseen use-cases. Aggregation pages are then built by issuing SPARQL queries to that central triple store. For example the England page automatically includes links to news articles that were tagged with the England team URI using this tagging tool. The same approach was scaled up and used to drive the London 2012 BBC web site, covering around 250 countries, 300 events, 36 sports, 10,000 athletes and 30 venues. This data is sourced from multiple places, both from Linked Open Data sources and commercial data providers. Once all this data is sourced and we have web identifiers for all these things in our centralised triple store, we can start annotating our content with them, in a similar way as done for the World Cup 2010 web site. We used this mechanism to build automated aggregation pages for each of these things - for each country, sport, athletes and so on, by querying the centralised triple store for all BBC items related to them. The BBC London 2012 web site has been hugely successfull, and has proved the feasibility of this approach, heavily based on Semantic Web technologies, using a triple store, queried through SPARQL, to store relationships between our content and domain knowledge. 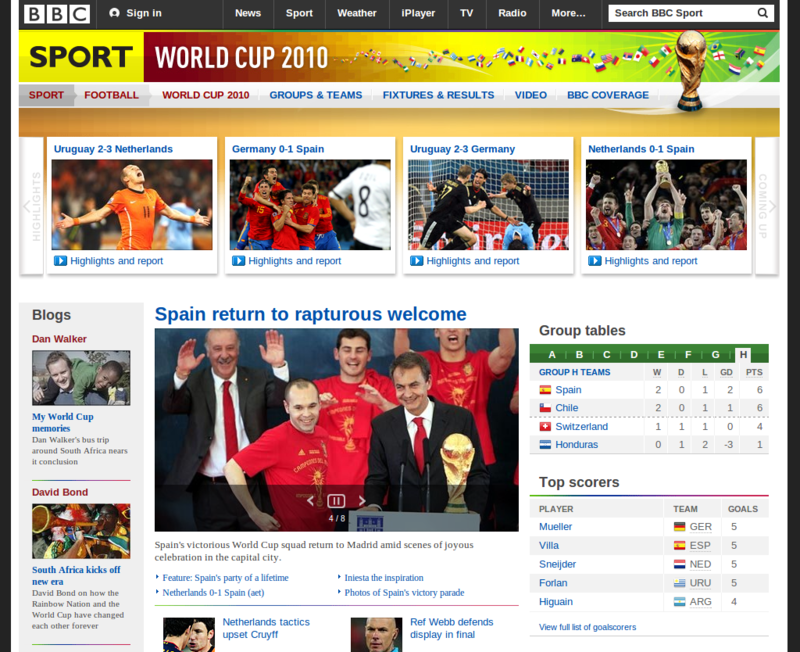 We're now extending that work beyond sports and to aggregate all sorts of BBC and non-BBC data. This will enable us to easily create feeds such as 'all news articles about Barak Obama', 'all videos about the place I am at', and to easily build cross-domain aggregations. In order to support this approach we created a bunch of ontologies, modelling the domain knowledge held within the LDP and often piggybacking on existing ones (event ontology, FOAF, music ontology, geonames, etc.). They are all available on our website at bbc.co.uk/ontologies. They cover programmes, wildlife, sports, learning and news and we use them as a backbone for the data in the LDP. 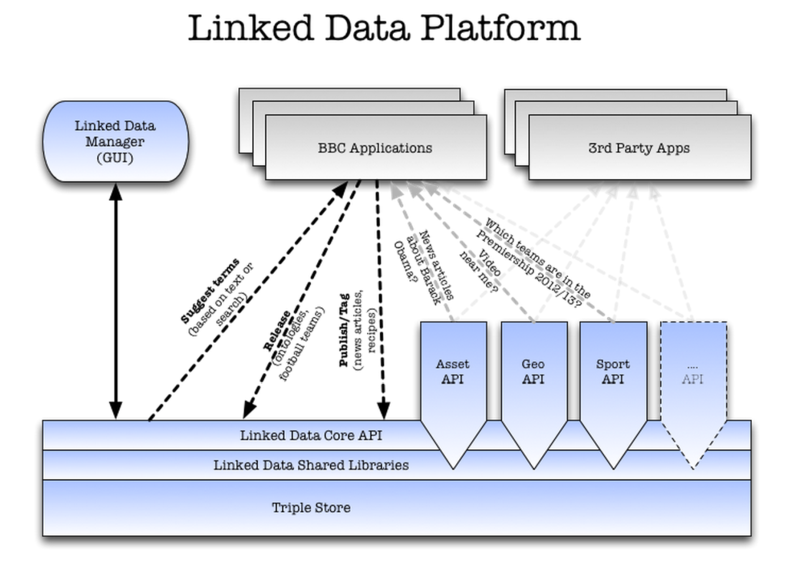 Most of the data available within the Linked Data Platform is created manually. It is a suitable approach going forward, but would be difficult to scale going backwards. In the rest of this talk we are going to describe ongoing efforts by BBC R&D to generate Linked Data describing our archive content in a semi-automatic way, using a mixture of machine-generated interlinks and crowdsourcing. Items within this archive have been catalogued using a number of systems throughout the years, such as this index card from April 1967. At the top of this card, we can see the classification of this particular item in a system called Lonclass, based on the Universal Decimal Classification system, and which provides very detailed information. 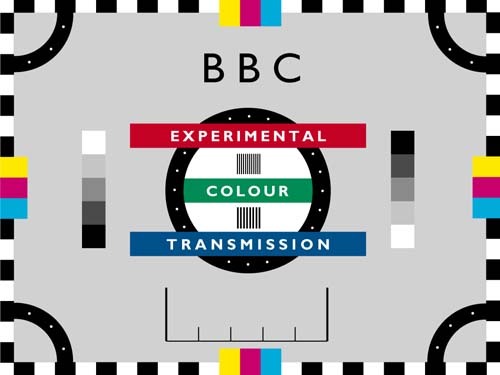 This cataloguing effort has been geared towards reuse, and the coverage of the catalogue is not uniform across the BBC's archive, for example excluding the BBC World Service which has been broadcasting to the world since 1932. Traditionally, when it has come to publishing archive content online, the BBC focused on specific topics or brands. An example of that is the Radio 4 In Our Time archive, giving access to all In Our Time episodes online. Another example are the BBC Four collections, focusing around particular topics rather than brands. For example this collection aggregates archive content around the army. In order to enable topic-based navigation within these collections, programmes are manually tagged with web identifiers (DBpedia in particular) using a tool similar as the journalist tool mentioned earlier. The resulting tags are then be used to generate topic-based aggregations. As mentioned before, the process of manual tagging is very time-consuming and would take a considerable time to apply to the entire archive. The problem is compounded by the lack of availability of textual metadata for a portion of the archive, and programmes for which we have no data or worse, wrong data - these ones which will always be left out of such brand or topic-specific slices of the archive. In the rest of the talk, we describe an alternative approach to publishing archives online. Instead of focusing on very thin slices of archive content, we purposefully expose large archives using machine-generated Linked Data describing this archive that can be inaccurate, and we try to involve users in helping us correct that automatically generated data. In particular, there is enough Linked Data available online to help us bootstrap an automated tagging process. An interesting example is the BBC World Service archive, which has been left out of the cataloguing and tagging efforts mentioned previously, but which has fully digitised its archive of pre-recorded programmes. For the English language part of the World Service, the archive holds around 70,000 programmes since 1947, which amounts to about three years of continuous audio. The data around these digitised programmes is quite sparse and some times wrong (e.g. lots of programmes with a broadcast date of 1901 or 2100). But as mentioned before, the content is accessible in digital format, as high quality wav files. Can we use the content itself to bootstrap search and navigation within such an archive? Ultimately the content itself has most of the data needed to unlock this archive. Of course listening to and annotating all of this archive would take a considerable amount of time, but can we automate this process? In particular, can we automatically tag content with web identifiers, in a similar way to what editors are doing on the BBC web site currently. The first step towards understanding what programmes are about is to figure out what was said in the programme. Here is a (very) high level overview of how speech recognition works. You extract features from an audio stream, and try to map that to a stream of text. In order to do so, you use a set of models: an acoustic model which models how features map to phones, a language model which models how likely particular sequences of words are, and finally a dictionary mapping sequences of phones to words. We use the Open Source CMU Sphinx toolkit for performing automated speech recognition. So we now need to isolate these useful clues, and infer the topics of the programme from them. Most of the existing concept tagging tools are designed to work on text that was manually written, and rely on punctuation, capitalisation, etc. We therefore developed our own tool. This tool first locates all these useful clues from the automated transcripts. It then uses the structure of the DBpedia graph to disambiguate and rank keywords spotted throughout the transcript. For example, if a programme mentions Paris and Tour Eiffeil a lot, we will pick Paris in France, as it is closer in the DBpedia graph to the Tour Eiffeil. If a programme mentions Paris and Texas a lot, we will pick Paris in Texas, as it is closer in the DBpedia graph to the Texas resource. For each programme, we get a ranked list of DBpedia tags, describing what the programme is about. Here are a couple of example results. The first programme is a 1970 profile of the composer Gustav Holst. The second programme is a 1983 profile of the Ayatollah Khomeini. The third programme is a 1983 episode of the Medical Programme. The tagging algorithm works relatively well for programmes that talk about a handful of topics, but works very poorly for magazine programmes, which talk about many many different topics. The algorithm gets very confused in this case. We now have a process which can derive for each programme within our archive a ranked list of descriptive Linked Data URIs, describing what each programme is about. However processing large archives remains a challenge. Tagging a programme can take around 90 minutes for a 60 minute programme on one CPU, meaning it would take more than 4 years to process the entire World Service archive. We therefore developed a framework to process very large archives using Amazon Web Services. A message queue distributes work between a number of independent `workers', hosted on AWS, and picking up new jobs as soon as they're up and ready to process data. Using AWS gives us a potentially infinite number of such workers, meaning that the only bottleneck to process a large archive is the bandwidth between our content servers and Amazon's servers. In our case it took around two weeks to process the whole archive (70,000 programmes), for a very low and predictable cost. After running that process, we had uniquely identified topics for all programmes in the World Service archive. This data can be used to bootstrap search and navigation within the archive, letting users discover and listen to programmes that often weren't listened to since they were last broadcast. We built the World Service archive prototype enabling users to explore this vast archive using that data. However, as with all automated process, this data can be wrong. For example as mentioned before the tagging algorithm works well for programmes that talk about a handful of topics, but works poorly for magazine programmes. In order to deal with that we built some features within the prototype enabling users to validate or invalidate the automatically extracted data. In particular, users can vote tags up or down, to approve or disapprove them, as shown on this slide. This feedback is used to make the search and navigation within the prototype more reliable, and could also be fed back directly in the automated tagging algorithm. It can also be used to evaluate how well our tools work from the users' point of view. As a result we're getting better and better interlinks between our archive and the Linked Data cloud. We also segment the audio depending on who is speaking. This enables users to get a quick overview of a particular programme and to jump to specific points in the audio. For example in this From Our Own Correspondent episode we see the presenter of the programme introducing various BBC correspondents who are each talking for a couple of minutes. However just after processing we know that individual speakers are contributing to the programme, but not who they are. We built a simple mechanism enabling users to name those speakers. This mechanism is also built on consensus - the name displayed by default will be the name chosen by the most users. We are also able to recognise speakers across programmes. Therefore the names added by users can be propagated to other programmes in the archive, detected as featuring the same speaker. For that we use an index for speakers based on Locality-Sensitive Hashing, a way to hash high-dimensional vectors with a collision probability that increases if the distance between two of these high-dimensional vectors decreases. Here we see that Nick Caistor's name (which I've entered in the previous slide) has been propagated to this other programme featuring him. As this was automatically inferred (and therefore can be mistaken some time), we provide a simple interface for users to validate this inference. This means that we can further evaluate and refine our speaker identification algorithm. For example, we can use the speaker names as a basis for evaluating our speaker identification algorithm. For each pairs of speakers with the same added name, did our algorithm think they were the same? We can derive precision and recall from this dataset. Here we see how precision and recall evolved as the dataset of manually added speaker names grew over time. We can see it is stabilising at around 85% precision and 54% recall. We have been slowly opening up the archive prototype to users. We have a bit more than two thousand users at the moment, and we got around 60,000 edits on tags. Given the relatively small amount of users we have at the moment, this is encouraging. We noticed in particular that a few committed users have done a very large amount of edits. One person tagged more than 200 programmes in a single week-end! Analysing user activity across the archive also shows an emerging structure. Without any specific community-building features, it is looking like communities are emerging around specific parts of the archive - drama, documentaries about specific composers, programmes featuring a particular contributor, etc. Such large archives of content are holding a significant amount of 'institutional memories'. A large number of topics will be covered in some form by the programmes held in this archive. In particular, the archive may hold programmes that could provide context for current news events. For example a 1983 `Medical Programme' episode on techniques for measles immunisation could help put in context a recent epidemic. This visualisation is trying to tackle exactly that: surfacing archive programmes that relate to current news events. The big blue dots are topics that were discussed on BBC News in the last five minutes. The small dots are programmes within the archive that relate to those topics. The red-er a dot is, the more connected it is - so the more likely it is to be relevant to a particular news event. We are going to present this visualisation in more details at ISWC this year. Everything I just presented is available online, as part of the World Service archive prototype developed by BBC R&D. Please sign up and let us know what you think! We want to apply the tools developed as part of this work to other archives. In order to do so, we need to create a platform that enables content owners and multimedia analysis service providers to easily share data and algorithms, without worrying about the boring stuff (scaling, monitoring, etc.). Such a platform could be used to enrich, interlink and unlock large archives of content. We just started a new collaborative project to develop such a platform - please come talk to me or email me if you're interested. We'll be talking more about that at IBC next week.